Trevor Pateman's Philately Blog: Katerynoslav Tridents: Work to Do? Katerynoslav Tridents: Work to Do? 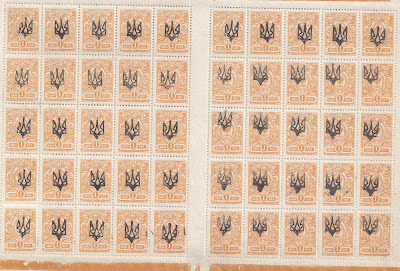 Trident collectors will know that Katerynoslav Type I was (normally) applied in a horizontal handstamp holding five Tridents clichés, so that 20 impressions were required to overprint a sheet of 100 kopeck value stamps. But how many handstamps were there? And were they modified when a Trident fell out or deteriorated? Bulat (page 46) illustrates just ONE handstamp of 5 but says that there were THREE different handstamps. Dr Seichter in a 1956 pamphlet says that "ungefähr 70 verschiedene Kombinationen" [about 70 different combinations] have been identified - not by him but (from the context) by C W Roberts. However, Seichter even in this specialised publication just about Katerynoslav illustrates just TWO variants: a "feiner Aufdruck" and a "grober Aufdruck" - a thin and a thick overprint, roughly as illustrated above from my holding of these Tridents. Well, frankly, this is not impressive. 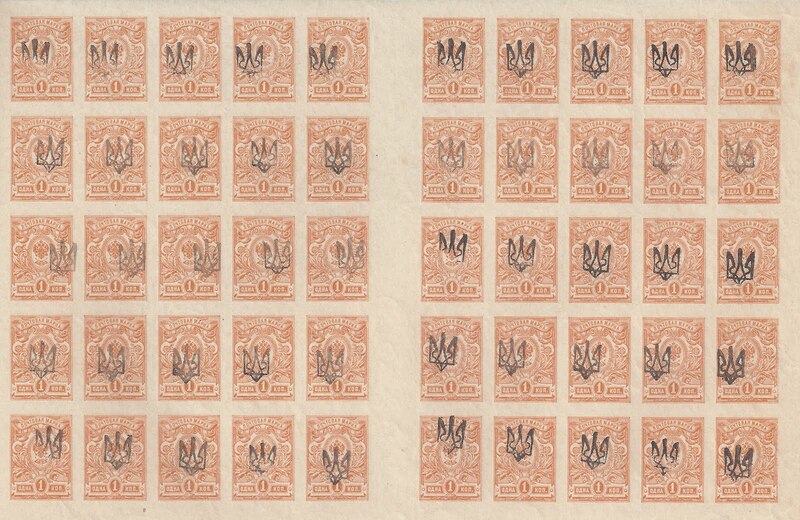 These stamps are not rare even in multiples and it ought to be possible to produce a guide which gives us the same kind of information as we have for Kyiv II or Poltava I. It may be that there were actually a small number of physically distinct handstamps but that individual clichés in the handstamp were frequently replaced due to them falling out or because of wear. In this way, THREE and SEVENTY might be brought closer together. I am not going to do the work. 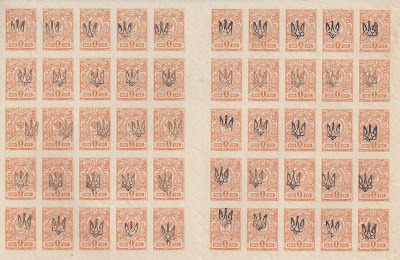 If someone is interested, I have here an accumulation (ex Zelonka) of 22 complete sheets, representing 22 of the 26 values overprinted including the 35 kopeck perforated and imperforate. Some of the sheets are a bit toned. 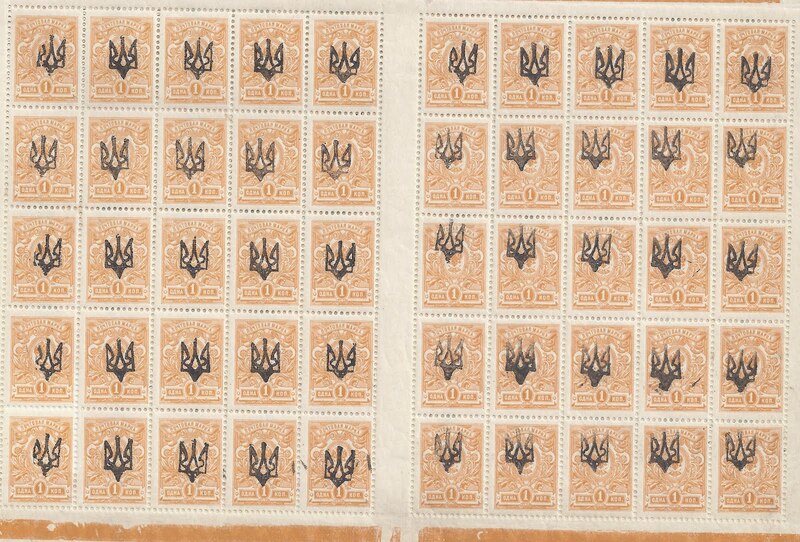 Anyway, the Bulat catalogue value is around $2870 for the basic stamps (no premium added for the multiples). I reckon 500 €uro a reasonable price for the Lot. And if a buyer succeeds in making progress on classifying the Handstamps, then he or she is invited to announce the results on this Blog to tell us how many Katerynoslav I handstamps there really are.... Get in touch if you are interested ( I may not reply before 112 September). Armenian Overprints on Turkish Fiscals?